GIS Dynamics was founded in 2005 as a Geographic Information Systems (GIS) company providing custom solutions to a variety of clients and industries. In early 2009, a GIS project for a New Jersey landscaper was the catalyst for what our company now focuses on today, our Software as a Service applications Go iLawn (www.GoiLawn.com) and Go iPave (www.GoiPave.com). These web based applications are designed to help lawn and landscape, snow removal and pavement maintenance contractors measure properties online to expedite the estimating and proposal process. The sites combine high resolution aerial photography, property measuring tools and property information in one easy-to-use format, allowing contractors to view and measure properties and generate proposals. This property was measured by Go iLawn user Gardens of Babylon, Nashville, TN. Property measurement is no longer people or weather dependent. 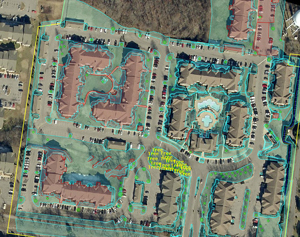 Anyone can use Go iLawn and Go iPave to obtain property measurements and pertinent property information for landscaping, pavement maintenance and snow removal proposals. See what our customers are saying about the benefits of online property measurement.